As summer is quickly winding to an end (hope that all of you had a great Labor Day weekend), I like to look for recipes that use up the wonderful corn and tomatoes that are so bountiful this time of year. I saw this recipe by Daniel Boulud in Elle Decor magazine a few weeks ago and stopped drooling long enough to tear it out and set it aside to try. 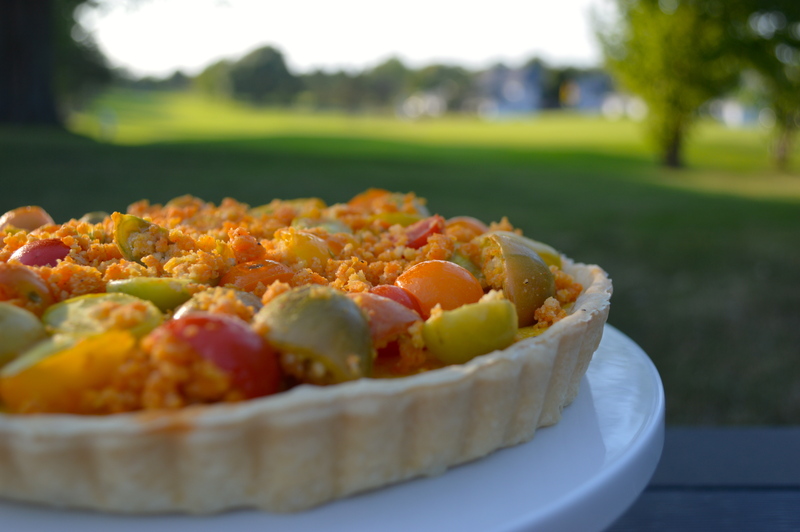 I am obsessed with heirlooms tomatoes, so I knew that this was going to be a good one but after reading the accompanying article where he described the tart as “Martha’s Vineyard meets Saint-Tropez” I couldn’t wait to make it. It’s a classic pâte brisée crust filled with a custard that’s half pureed and half whole sautéed fresh corn and onion. 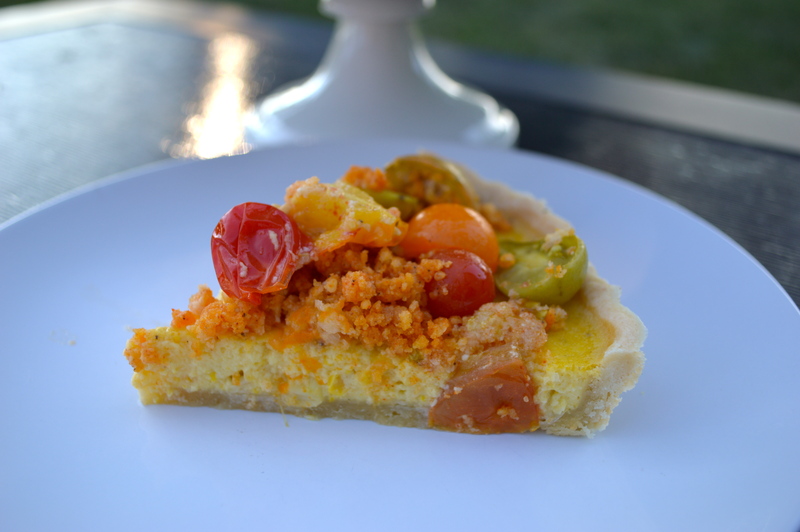 The tart is then topped with a mélange of heirloom tomatoes and smoked paprika seasoned breadcrumbs that give the whole thing a really satisfying crunch. I paired the tart with a rosé wine (Chateau L’ermitage is my favorite) that went perfectly with the sweetness of the corn. The whole thing was incredible and a perfect end-ofo-summer recipe, I can’t wait to make it again! Start by making your pâte brisée. I make mine slightly different from the recipe that was in Elle Magazine and I always have extra that I keep in my freezer. That way I just have to pop it in the fridge the night before I make a tart or a pie and I’m good to go! Combine 2 1/2 cups of flour, 1 tsp salt and 1 tsp sugar in the bowl of a food processor and pulse to combine. Add in 2 sticks cold unsalted butter cut into small pieces and pulse until your mixture resembles a coarse meal. Add in 1/4 cup ice water a little at a time while pulsing until your dough just starts to come together (you don’t want it too wet). Turn out onto the counter and knead together, divide into two even discs and wrap in plastic. You only need one disc for this recipe so put one in the fridge for at least 30 minutes and throw the other one in the fridge for another time! Center a rack in your oven and preheat it to 350 degrees. Roll your pâte brisée into about a 10″ circle that’s 1/8″ thick. 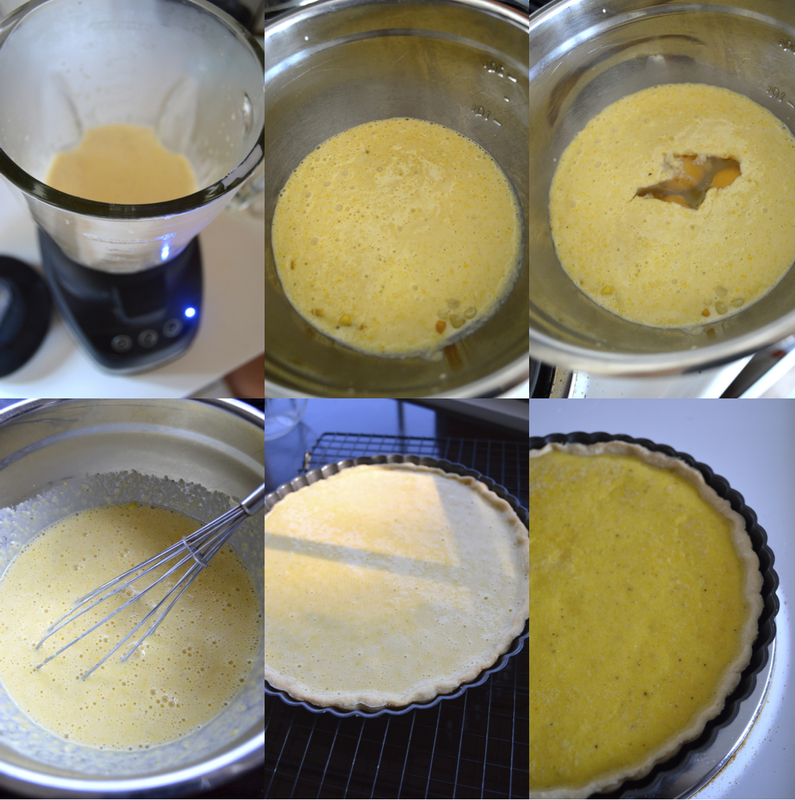 Carefully place it over a 9″ fluted tart pan with a removable bottom and gently push it down into the pan. Trim some of the excess to make it easier for you and then use your index finger and thumb to press into the fluted edges. Roll your rolling pin over the top of the tart pan as an easy way to get rid of the excess dough. Dock the bottom of the shell with a fork and freeze until firm, about 20 minutes. 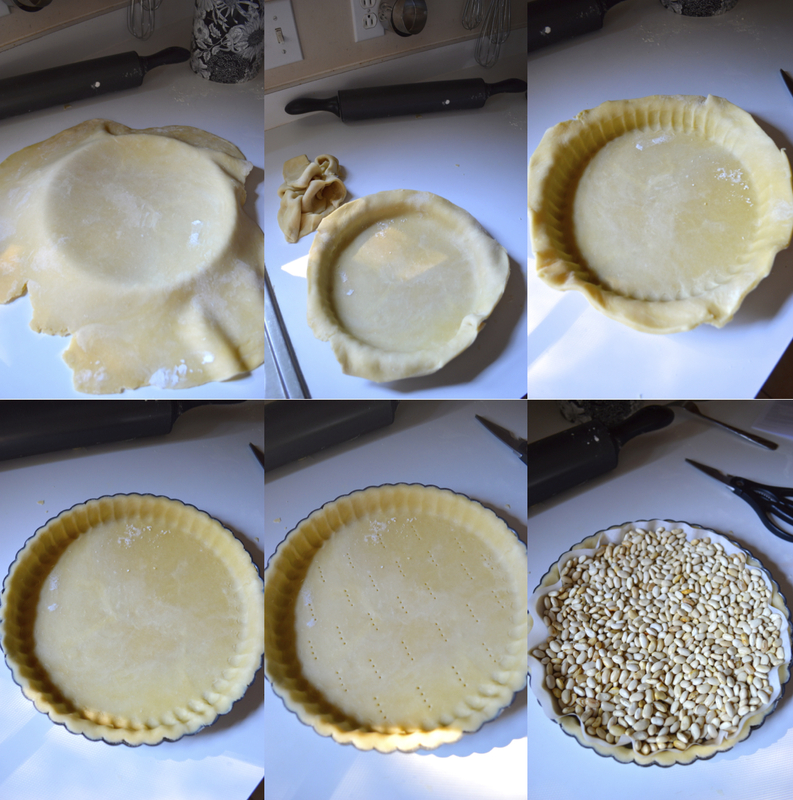 Cut a 10″ round out of parchment paper, place it in the tart shell and fill it with dried beans or pie weights. This will help to keep the shape of the shell and stop the bottom from bubbling up. Bake like this for 20 minutes and then carefully remove the parchment and the weights. Place back in the oven and bake for 3-5 minutes more until lightly browned. Set aside in the tart pan on a baking rack to cool while you make the filling. Knock the temperature of the oven down to 300 degrees. In a medium sauté pan over medium heat, melt 1 tbsp unsalted butter. Add in 1/4 cup chopped white onion and 2 minced garlic cloves. Cook while stirring for 4 minutes until the onions are soft and translucent. 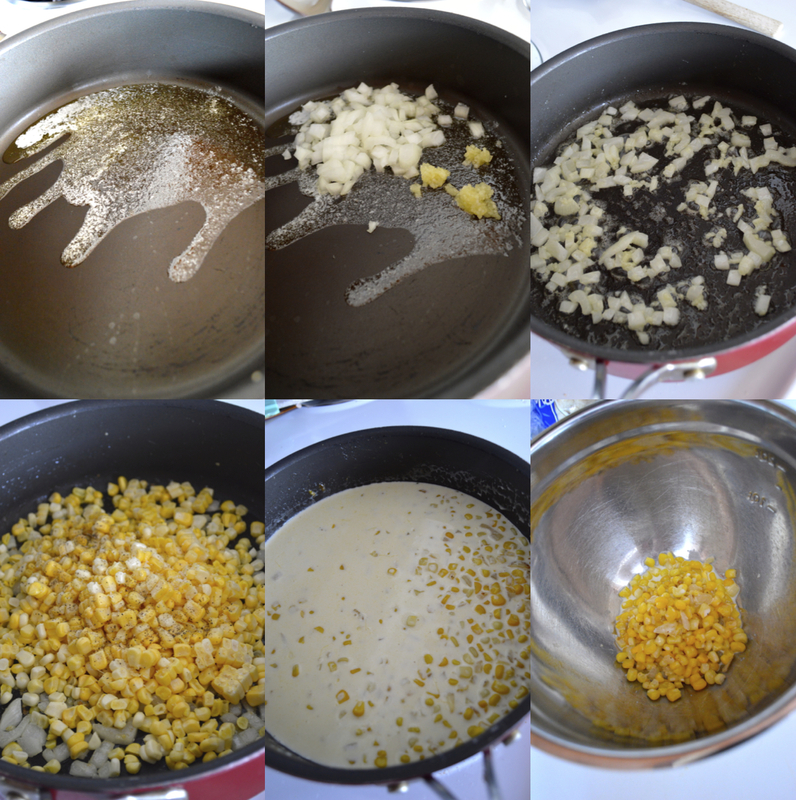 Add 1 1/2 cups fresh corn kernels (from about 2 big ears of corn) and season with salt and pepper. Cook for 5 minutes and put 1/2 cup of the corn mixture in a large mixing bowl. Add 1 cup heavy cream to the pan and bring to a simmer. Transfer the mixture to a blender and blend until smooth. Pour into the mixing bowl with the whole corn and add 3 whole eggs, one egg yolk, a dash of hot sauce and a sprinkle of salt and pepper. Whisk together well and pour into the tart shell (not all of my filling fit into the shell, you may have some leftover). Bake until the custard is just set, about 25-30 minutes. While the custard is baking you can prepare the tomato mélange for the topping. In a medium mixing bowl toss together 1/3 cup panko breadcrumbs, 1/4 cup grated parmesan cheese, 1/2 tsp smoked paprika, a sprinkle of salt and pepper. Add in 2 tbsp melted unsalted butter and toss. Add 1/2 lb heirloom tomatoes… our farmer’s market had heirloom cherry tomatoes so I just halved them and quartered the larger ones, but you can also use regular heirloom tomatoes by cutting them into bite sized pieces. 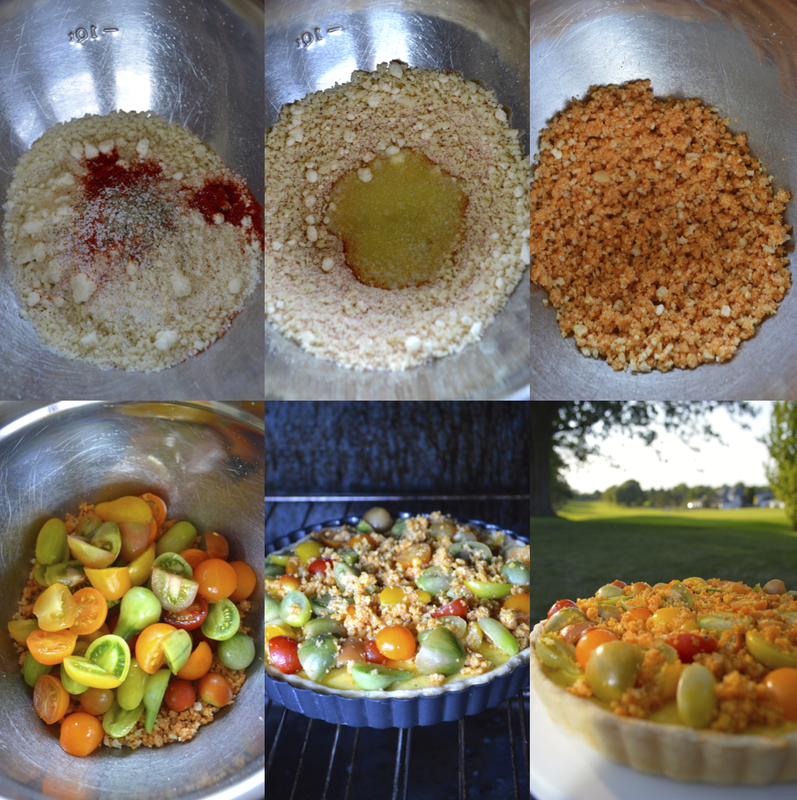 Put the topping over the tart and bake for 15 minutes more until the tomatoes are softened and the breadcrumbs and lightly golden. Allow the tart to cool on a wire rack in the pan for about 15 minutes before removing it and cutting the slices. I served ours with a green salad and ate it both warmed and cold, it was great both ways! Danielle – you need to audition for Masterchef! You’re the real deal. this is GORGEOUS! and it looks amazing! !